I stood in the upstairs hallway at my parents' house, reading title after title on their haphazardly piled bookshelves. I'm ashamed to admit the reason that I was scrutinizing the spines so closely: I was looking for books to get rid of. My parents' house groans under its surplus of books (and unnecessary kitchen appliances, and hotel shampoos, and clothes from the seventies). My hips practically brush up against the sides of the narrow corridor lined on both sides with shelves. They don't have time enough left on earth to read all these books, I thought, then corrected myself, My four-year-old doesn't have enough time left to read all of these books. Nobody has time enough to read all of these books. I am a book lover myself with a sizable collection, so I felt a little guilty critiquing Mum and Dad. Although I love a tidy space, I laugh at the things my books about organizing—of which I have collected several—tell me: "If you haven't read it yet, you never will." Not true. 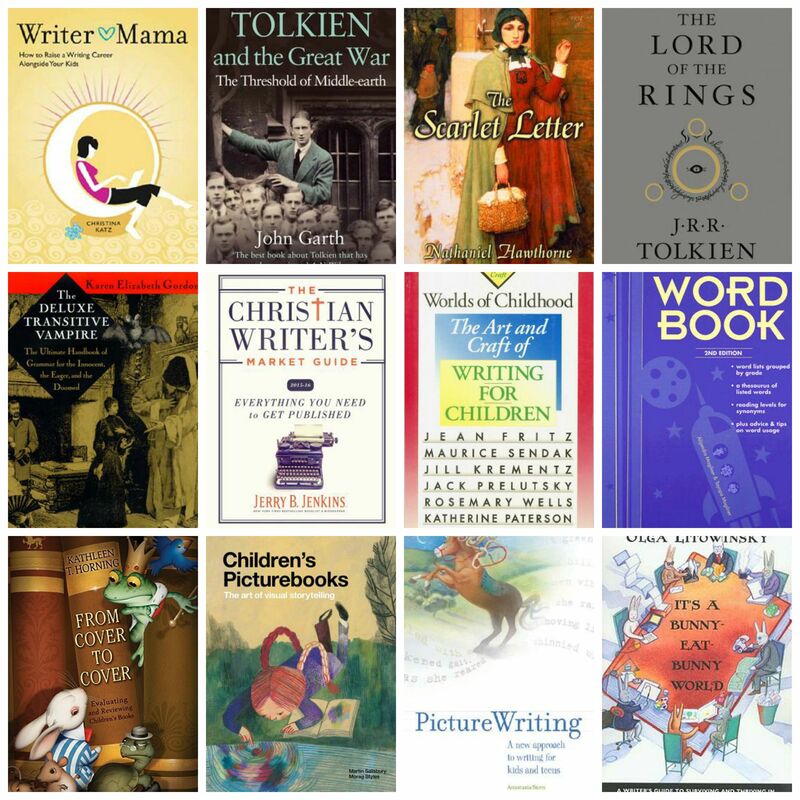 I had Writer Mama two years before I ever cracked the cover; Tolkien and the Great War took me eight to open. "You're unlikely to read most books more than once." Ha. What about The Scarlet Letter, The Lord of the Rings, and everything Dickens? The minimalist authors don't even give a nod to two of the main reasons for having lots of books: so that my children can enjoy them, and reference. There are so many old friends that I want my kids to meet: Paddington Bear, Laura Ingalls, Johnny Tremain, Anne Shirley, and Jo March, among others. And how can I build my dream house without my books full of floor plans? I could teach English Comp again without The Deluxe Transitive Vampire, but would I want to? Someday I might write a novel set in 1890 or 1920 or 1956, and then I'll need to consult one of my vintage etiquette guides. I need those books. The labyrinth of bookcases at my parents' house was my place of enchantment as a child. My parents gave me a love of books and reading and stories with these very volumes. So it was with base ingratitude that I analyzed the shelves with an editor's eye, looking for redundancy, irrelevance. These were not my books. It was none of my business. I thought my parents would be happier with less stuff; that's all, really. I was occasionally concerned that a pile of something in their home would topple onto one of my small children and flatten them, but basically, more order makes me happy, and I thought it would add to their already ample joy. When it comes to my parents, I'm a busybody. I'll make a terrible mother-in-law someday if I don’t get over this tendency. Continuing to search, I mentally sorted scattered titles into themes. I expected to see the historical fiction, the cake decorating books, the miles of Amish fiction that I would eliminate in a flash if I could. Another theme emerged that I did not expect. The Christian Writer's Market Guide. Wonder how outdated that is? The Art and Craft of Writing for Children. Ah, Mum. So many ambitious plans. Children's Writers Word Book. Ha, ha, you'd think she was a serious writer. From Cover to Cover: Evaluating and Reviewing Children's Books; Children's Picture Books; Picture Writing; and, my favorite, It's a Bunny Eat Bunny World: A Writer’s Guide to Surviving and Thriving in Today's Competitive Children’s Book Market. Book after book on writing and writers. As I realized the implications of this collection, my condescending chuckle turned into watery eyes: my mom wants to be a writer, and she has wanted this for years and years. I should have known. This wasn't the first time I had looked long and hard at this bookshelf. At the periphery of my mind, I guess I did know, and I never took her dream seriously. The weight of her unrealized dream and my own thoughtlessness was suddenly heavier than the big stack of books she'd collected on the topic of breaking into print. I know how heavy this unrealized dream can be. My first books were scrawled in crayon, bound in masking tape, and proudly displayed in my dad’s bookshop when I was five. At twelve, I understood that I needed an SASE if I wanted my mss returned. Successes in school and church-sponsored writing contests were balanced by the rejection slips I started collecting in junior high. I have been living the writing life for 30 years. I always wanted a writing career, but I've only in the past few months really understood the organized effort that will be required, especially with the many demands of motherhood. Becoming a mother has added so much poignancy to my desire to write. The kids come first, they really do, but at times I've wondered where I am. Do I exist at all? I have to write to know that I exist. I have to write because I believe it is the talent I am steward of. I have to write so that my children will know all of me, and so that they will know that the exercise of a gift and a desire is a worthy use of precious time. I have to write in order to be a whole person, and I have to be a whole person to be a good Mumma. This year, my husband and I have committed to making my writing more of a priority as we plan our days and weeks. At six and four, the kids require less of my constant attention. He takes care of our children two mornings a week and every other Saturday so that I can work at a local café or library. (I find it distracting to write at home, even if the kids aren’t there.) We're still struggling to put this schedule into practice. At the best of times, this arrangement gives me about 15 hours a week; anything else I grab in snatches throughout the day, an e-mail here, an interview request there. I struggle to produce the quality work I desire without long, uninterrupted stretches. Still, I keep trying and I tell myself I’m making progress. But it's hard. Sometimes it seems impossible, and they are too little to understand. They stand at my elbow while I'm writing, talking about cookies or ants or toy cars, and they won’t be put off by answers produced by one-quarter of my brain. They want my full attention. Frankly, I don't have much to say about cookies or ants or tiny cars even when I’m not trying to write, and I long for my children to be able to understand and appreciate the work I am trying to do. At the same time, my own mom wants to be a writer, and I have been too full of myself to see it even when I saw it, even when she spoke of it outright. Over supper at their home, she asked modestly, "Will you read my poetry? You know about these things." "Have you seen the ants in the driveway?" I responded, "They're tearing it up." On a shopping trip together, she optimistically said, "I have an idea for a picture book." "Daniel keeps buying the kids cars," I answered, "Where will I put more little cars?" While we were helping my sister move, she began to tell me, "I'm taking an online writing class, and I’m struggling with this assignment." "Ugh, I know what you mean. I have to bake cookies for the bake sale. No time, no time," I countered, and thought, What kind of racket has she been roped into now? In the months before my son was born, my mom hounded me to go to a writer's conference with her. "Too close to my due date," I said; but when my son was a week old, I decided I could handle it, if it wasn't too late and if they’d let a baby come. It wasn't too late, they did let him come, and I profited from the experience. I learned that even publishing in local papers is resume material; I learned not to insult my audience, however few readers I have; I learned that the $200 I had earned that year was actually not bad for a writer just starting out. My mom, already registered but anxious not to go alone, even paid for me to go. She brought manuscripts and I read them, so how could it not occur to me that she actually wants to be a writer? I took it as a passing thought, an idle hobby, one of a handful of disparate alternate career paths she has suggested for herself, from RV salesperson to Zamboni driver. I didn't take her seriously, I who want so desperately to be taken seriously myself. Writing may not define my mother the way that it defines me. She was an amazing elementary school teacher for many years. One night we met a girl in North Carolina, far from my hometown in Maine. My mom had been her second grade teacher, and she said in a voice touched with gratitude and enthusiasm, "She taught me to read!" She taught many kids to read, to add and subtract, to reason. These masterpieces already sit on the metaphorical shelf of her life's work. She may lack the drive to set aside as many hours as I try to, devoted solely to writing, or maybe she does have the drive. It doesn't matter either way. It's not a competition. Desires and dreams can't be quantified in objective terms. If I am more serious about my writing, it only deepens my responsibility to help and encourage her, because I might have tools she needs to succeed, if that's what she really wants. Last spring, Mothers Always Write asked me to provide a couple of sentences about my mom for a Mother's Day feature, something lovely or funny or memorable she'd said or made me do as a child. After a few days mulling my childhood over, finally it clicked: Mum read stories to me, and she made books come alive. She made me who I am, a reader and writer, a lover of stories. For sixteen years, she has been telling her grandchildren "The Three Little Pigs" with different plot twists every time. They beg her for it whenever we ride in the car with her. She is a master storyteller and I know it. My children had a similar assignment for Mother's Day this year. 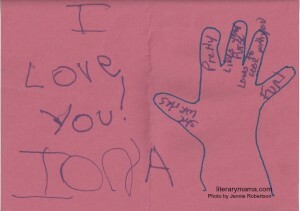 They traced their hands to make cards and for each finger dictated words to their teacher to describe me. 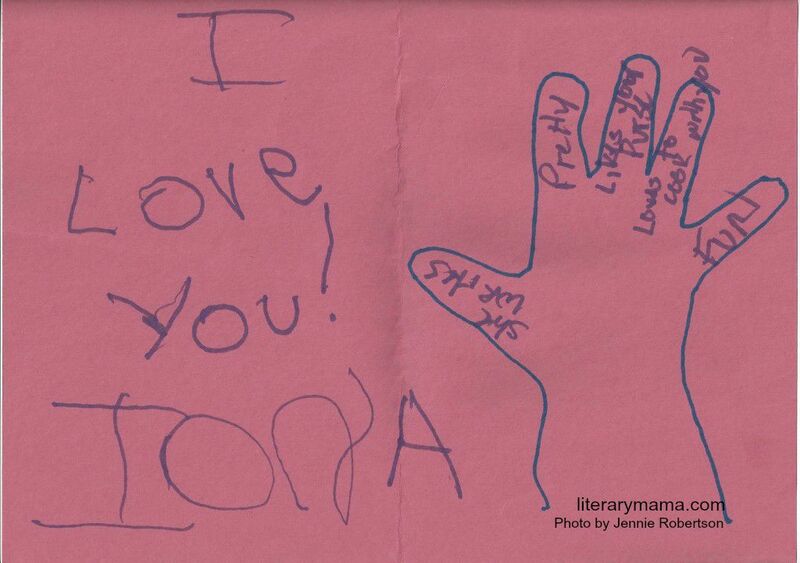 The first finger of my four-year-old daughter's hand read, "She writes." This thrilled me. My writing is me, and it made me happy that she saw and understood me. It also challenged me to be as perceptive about my own mother. So let me tell you about my mom: she writes. Jennie Robertson lives and writes from rural New England. She has been published in Mary Jane’s Farm and Yummy Mummy Club and is a regular contributor to Thinking Outside the Sandbox. She is the book review editor at Mothers Always Write. This resonated with me on so many levels, I was startled. You got my full attention. All the heartache, all the mother daughter complication over career and writing and motherhood, all the confusion over order and books and collecting, just stunning. I may print this out, it spoke to me so completely. What a beautiful piece. My mom is a reader, and has always tried to talk about life with me through the books she's reading. I share a lot of parallels with your story. Why is it that we don't see our own mothers the same way we would want to be seen? But that last sentence, She Writes... It's the thing I'm also most proud of when my children say what my "job" is. Thank you for this lovely post.